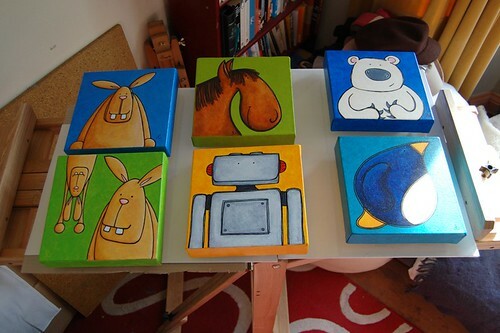 Rex Robot and Big Fat Penguin of Determination have both been listed on my web site for direct sale today. I’m going to keep hold of Pete in Two Claws and Paws for the time being. He’s helping to keep me inspired. Horse With No Name has been reserved. Not quite sold as he’s not had his final varnish yet. That’s on my list to do this week along with varnishing and photographing 3 new paintings all featuring goofy bunnies. Here’s a sneak preview of the finished Bruiser Bunny and Bunny High Jinx paintings as they sit alongside other paintings drying from their isolation layers and varnish respectively. All are acrylic paintings on 8″ x 8″ (20cm square) on deep edge box canvas. I’m so glad my snazzy easel will flip all the way up to provide a horizontal surface to work on. It’s very handy. My next painting is going to be a polar bear getting up to a little mischief! Rachel, it’s bloody brilliant what you are doing, though sorry to hear that the lovely horse is already on reserve. Not surprised. As inspirations go – yes, your “Teddy” has all that a muse needs – mainly claws to keep you in the grip of creativity. I admire you: I run around all day (and most of the night) like the proverbial chicken with its head cut off (now there is a motif for a painting of yours) achieving very little. How come? Wonderful work and so good to see part of the process – these pieces look just beautiful! I’m still figuring out what to do with my urge to sketch cartoons – and then what to do with them! Maybe just a blog. Cusp – I’m still not sure how organised I am! Thanks. From tiny acorns eh? Ursula – Well thank you. I am hoping to do more horse paintings so maybe something else will catch your eye. I am very lucky that Mr Creative provides a lifestyle where he takes the lions share of proverbial chicken with head cut off. Although of course he is brilliant and there’s not much that flusters him. I get to be selfish with my time and it’s an utter luxury! Adam Thanks. I have in mind to do some video at some point of doing a painting but haven’t figured out how to mount the camera so it’s not in the way. I may have to do some bits camera in one hand paint brush in the other! For me the main thing was to just start doing the drawings. Blogging them was a good way to keep me motivated to keep doing the work. Over time different things have grown out of that. So if you can find a way to just start doing the cartoons that the place to start. I’d like to see more of them! Your art is very colorful and sweet. The animals are fun and quirky. Wonderful and entertaining work.